The Soka is a 14 teeth texturising chunking scissor handcrafted in Japan using ATS-314 steel. Finished with a lightweight ergonomic offset handle for supreme comfort while working. The Soka has specially designed V grooved teeth to guide the hair into the teeth to ensure the correct amount of hair is cut. 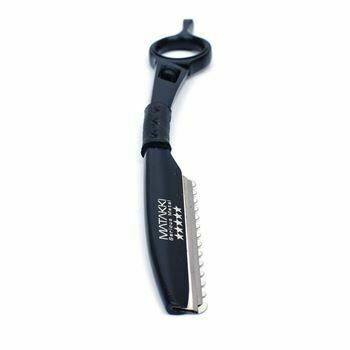 This texture scissor will remove approximately 35% hair which is ideal for sculpting and shaping. Use in addition to The Akechi for dramatic results.